Glen gets into the kitchen and walks us through what it takes to build a chocolate chip cookie recipe from scratch. He walks us through the idea of bakers percentage - which helps us to understand how the ingredients work with each other as well as how to easily change the amounts to get cookies with different taste and texture. Commercial kitchens, and recipe developers rely on ‘Bakers Percentage’ to work out what a baking recipe should be. Pretty much every Baking recipe (cakes, cookies, bread, etc) have a base formula that is known to work and give a certain result. Recipe developers take these ‘knowns’ and manipulate the percentages to create new recipes. Baker’s Percentage is expressing all the ingredient amounts by weight as a percentage of the weight of the flour… not that complicated, but we’ll do a video in the future all about that. 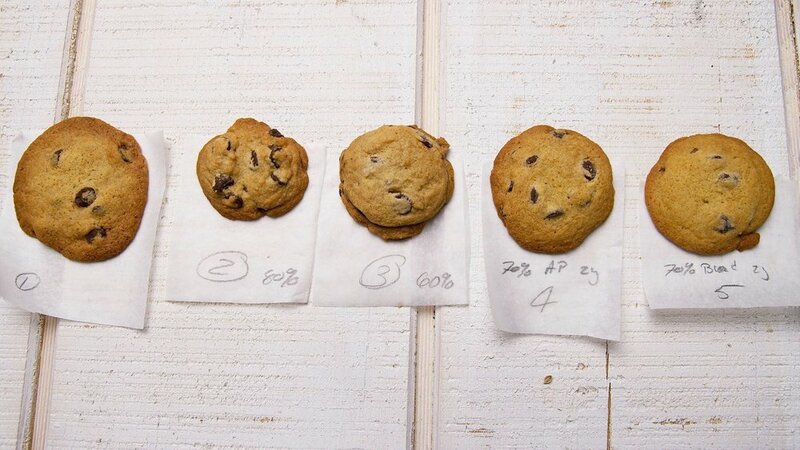 In the end - we change the proportion of butter and sugar to get a cookie that is chewy, crispy, or cakey.